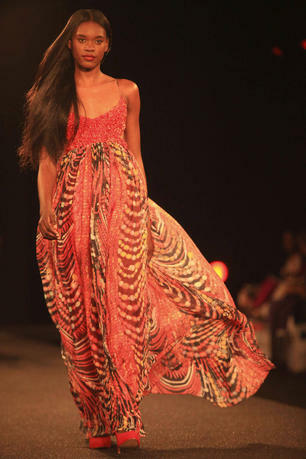 Rip The Runway (RTR) held on 19th July, 2013 at the African Bar, Oriental hotel, Lekki, Lagos. The show which was powered by BET was a collision of Music and Fashion. The idea behind RTR is having artistes perform while models walk the runway in various designers' outfits. It started with a Red carpet with TolaMeora where the guests had their pictures taken and were interviewed. Designers at the show include Xzomo couture, Old Religion, Niole, Vanity, Zeus, Blaze, Bend down select, Ankara freak, XnO's and RetroDream. There was also an Art exhibition by Claire Idera and Bleek. Among those billed to perform at the show were Yung L, Kryptic kids, Haywire and the most anticipated of all, Burna boy. Unfortunately, he did not get to perform, apparently, this was due to some misunderstandings that took place backstage. Some designers who were present at the event also did not get to showcase their designs on the runway. This left them disappointed as the show had been highly anticipated. Despite all the shortcomings, the show was generally a fun one as the guests were entertained by the artistes that got to perform!